1. Chaim Tchernowitz was born in 1871 in Sebesh, Vitebsk in the Russian Empire. He studied in Lithuania with Isaac Elhanan Spektor and was ordained in 1896. 2. He aimed to rejuvenate Jewish learning by combining traditional study with modern research. He opened a yeshiva in Odessa in 1897 and later transformed it into a rabbinical seminary (1907). He believed that study was the center of Jewish life, as opposed to prayer, and the house of study as opposed to the synagogue. The seminary was attended by such later luminaries as Hayyim Nachman Bialik [see my post of May 22, 2013] and Joseph Klausner. 3. In 1914, he earned a Ph.D. in Judaica from the University of Wuerzburg. After WWI, in 1923, he settled in the United States and taught Talmud at the Jewish Institute of Religion, started by Rabbi Stephen S. Wise in New York. 4. He started writing scholarly papers as early as 1898, when his first article appeared in HaShiloah. He wrote studies on the codes of law preceding Joseph Caro [see my post of October 2, 2013] and general articles on Talmud. His books were mainly methodological studies aimed at modernizing the teaching of Talmud. 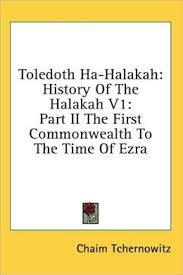 He wrote four volumes on the development of Halakhah from pre-Mosaic times until the Second Temple. Then he produced a further three volumes on post Talmudic thought through the medieval period. 5. He thus authored a comprehensive history of Jewish law. In a less scholarly vein, he wrote articles in Hebrew and Yiddsh concerning Zionism and contemporary Jewish issues. 7. In 1940, he founded Bitzaron, a Hebrew monthly, which he edited until his death in 1949. Many of his essays of this period were later collected in book form. They included humorous autobiographical sketches, as well as articles on Mendele Mokher Seforim, Bialik, Ahad HaAm [see my post of April 24, 2013] and others. 8. A good portion of his work remains in print today. In addition, an archive of his correspondence and other writings may be found at the American Jewish Archives in Cincinnati. 9. Among his friends was Albert Einstein (shown at left, with Tchernowitz on the right), who praised his work in making Torah accessible. In Tel Aviv, the street named for HaRav Zair runs north from Bene Moshe, parallel to Weizmann. 1. Eliezer Kaplan was born in Minsk in 1891. He attended cheder and Russian high school, then went on to polytechnic university in Moscow, where he graduated in 1917 as a building engineer. 2. While in school, he joined the Socialist Zionist Party. He was one of the founders of the Youth of Zion – Renewal movement and a member of the Youth of Zion (Ze’irei Zion) central committee. 3. During World War I he was active in helping Jewish refugees. He was a member of the Ukrainian Jewish delegation to the Versailles Peace Conference in 1919. 4. He made aliyah in 1920. In Palestine, he was one of the initiators of the merger between Ze’irei Zion and HaPoel HaZair to become Hitachdut (haHichtachdut haOlamit), with a program of pioneering and labor socialism. He represented the organization at the London Zionist Conference of 1920, where he was elected to the Zionist Executive Committee and then sent to Berlin to head the Hitachdut world office. 5. In 1923, he returned to Palestine and joined the Office of Public Works of Histradut (note: not Hichtachdut). In 1925, he was elected to the Tel Aviv City Council, a position he held until 1933. 6. He joined the board of the Jewish Agency in 1933, serving as its treasurer until 1949 and head of its Settlement Department from 1943-48. As treasurer, he obtained the first foreign loan for the Jewish Agency from Barclays Bank in London. Other loans followed, and he introduced meticulous supervision over expenditures. It was his financial acumen that gave him an important role in the developing Jewish state. 8. When the State of Israel was in its gestation, Kaplan was a member of the Assembly of Representatives, signing the Israeli Declaration of Independence on May 14, 1948. He was appointed Minister of Finance in the provisional government and elected to the first Knesset as a member of Mapai. In Ben-Gurion’s first government, he served as both Finance Minister and Minister of Trade and Industry. 9. Kaplan laid the foundation for the State of Israel’s fiscal policy, shaping its first budgets and its taxation structure. He headed the committee for establishment of a state bank, securing the bank’s independence. He was particularly interested in agricultural settlements and worked to strengthen their economic foundations. He published several books on the economy of Israel. 10. In 1949, he obtained the first loan for the State of Israel from the Import and Export Bank of the United States. Later, he contributed to organizing the sale of Israel Bonds in the United States. 11. In June 1959, he became the country’s first Deputy Prime Minister – but died three weeks later while on a trip to Genoa. Thousands upon thousands of immigrants lined the three-mile road into Tel Aviv when his body was returned to Israel, honoring the man whose stringent financial oversight made their aliyot possible. 12. All over Israel, his name is honored: the Kaplan Medical Center in Rehovot; Kiryat Eliezer, a suburb of Netanya; the Eliezer neighborhood of Kfar Saba; Kiryat Eliezer in Haifa; and the Eliezer Kaplan School of Politics and Social Sciences at Hebrew University. In Tel Aviv, if you follow Dizengoff eastward, you will come to Kaplan after crossing Ibn Gevirol. In Jerusalem, Eli’ezer H. Kaplan Street fronts the Knesset, and is the site of many a protest. Author’s note: OOOPS! This was scheduled for November 20. I don’t know why it didn’t post. Perhaps I forgot to push the “Publish” button. Anyway, lucky you, you get an extra post for Hanukah. 1. Beba Trachtenberg was born in October 1895 in Yekaterinoslav, in the Russian empire. Though the family was far from wealthy, the children were well educated. An older sister became a gynecologist. Beba was educated first by a private tutor, then in high school and university. When Beba was eight, her mother died in childbirth (thirteenth child). Her father died four years later. Beba helped raise her younger siblings, under the care of her grandmother. 2. In 1912, at the age of sixteen, she graduated from the Russian gymnasium and began studying economics and statistics at the University of Ukraine. At the time, she was an advocate of Russian – rather than Jewish – culture, but the Beilis blood libel trial in 1913 began bringing her to greater Jewish awareness. In 1915, as the Great War sent Jewish refugees from Austria across Ukraine’s western border, she volunteered in relief activities, joining an organization called Youth of Zion and meeting its leader, Israel Idelson. 3. The increasing unrest in Russia led her to involvement in Jewish self-defense training, as the Jewish students became more and more aligned with Zionist ideology. In 1917, she married Israel Idelson (later Bar-Yehudah), and their household became a magnet for Zionist activists. The couple moved to Kharkov in 1919. She continued her studies, he his Zionist work. In 1923 they were exiled to Siberia, but the horror of exile was replaced by deportation after timely intervention by Maxim Gorky’s wife. 4. They left the Soviet Union in 1924, spending two years in Berlin, where they were active in the World Union of Socialist Zionists. In April 1926 they reached Palestine. Israel was appointed secretary of the Workers’ Council in Petach Tikvah. At first she did agricultural work, but was then hired in 1927 as a statistician at the Jewish Agency in Jerusalem. 5. In 1928, Israel Idelson was appointed to the central comptrolling committee of the Executive Council of Histradut, the organization of trade unions. They moved to Tel Aviv. 6. It was in Tel Aviv, helping conduct a census of domestic workers, that Beba Idelson became aware of the wretched condition of women workers. She began working in the Tel Aviv Women’s Employment Bureau. She was one of the founders, and by 1930 became secretary, of the Organization of Working Women. 7. The Mo’ezet HaPoalot was the women’s section of Histradut. In the summer of 1931, she was asked to step in temporarily for its leaders in the secretariat. She became a permanent member of the secretariat and remained so until 1974, a tenure of nearly forty-five years. Lack of funds was a major obstacle to the development of the women’s movement, and she was good at handling money. 8. Here are some of her accomplishments: She organized the wives of Histradut and the Workers’ Movement to collaborate, got them membership cards and the right to participate in party elections. She was active in the Council of Women’s Organizations organized by Henrietta Szold [see my post of August 7, 2013] in the mid 1930s and, after the State of Israel was established, its chairwoman. She was a board member of Mishan, a Histradut institution supporting homes for orphans and the elderly; a board member of the Women’s International Zionist Organization for sixteen years; a Mapai delegate to the nineteenth Zionist Congress (1935); chair of Histradut’s ninth congress and a member of its central committee (1960s); and a member of the Flag and Emblem committee of the Provisional State Council, which chose the emblem of the State of Israel. 9. She believed in women’s economic independence and opposed any pressure on married women to resign from their jobs. Working through Histradut, she achieved a ban on dismissing women for this reason. She believed, as well, in women’s obligations to the state, advocating for conscription of women and supporting a national service law. In World War II, 3200 women served in the Women’s Auxiliary services of the British Army. She was one of the leading proponents for this volunteerism. Later, when the State of Israel was established, she became a member of the Knesset, working on the Constitution, Law and Justice, House, Foreign Affairs and Defense and Labor committees during her sixteen years of service. In all these functions, she continued to promote social reforms, particularly around women’s equality. 10. Her legislative activities affected the character of the new state, especially as regards the public status of women. Successful legislation she helped formulate included marital age (1951); women’s work (1953); national insurance, including insurance of mothers and pensions for widows (1953); inheritance law (1958); criminal law amendment (1959), equality law (1962). She tried, but was unable, to pass laws establishing civil, non-religious, matrimony and family courts. 11. In 1965, the year she left the Knesset, she was named Mother of the Year. She went on to chair the World Movement of Pioneer Women from 1968-75. 12. She died in January 1975 in Tel Aviv. Would you call her a late bloomer? If so, she didn’t she make up for lost time! In Tel Aviv, Idelson Street crosses Pinsker and is west of Bialik. 1. Kalonymus Wissotzky was born in 1824 in Zhagare in the Kovno province of Lithuania. As a young man, he attended yeshivot in Volozhin and in Kovno. It was during this time, influenced by his studies with the Salanter rabbi, that he resolved to dedicate ten percent of his income to charity. 2. Having tried, but failed, at farming, he moved to Moscow and established a tea company. This was either in 1849 or 1858, depending on which source you believe, but what is certain is that by the 1870s, he had become a major force in tea trading. 3. He owned the concession for the tsar’s entire military operation. He opened branches in New York, London and elsewhere. The Wissotzky Tea Company in Israel today descends from his firm. 4. He was an early and dedicated supporter of Jewish settlement in Palestine. A proponent of Hovevei Zion, he gave money for establishment of neighborhoods in Jerusalem, helped finance a Jewish school in Jaffa, and funded land purchases for Jewish workers. He was a member of the Odessa Committee, which promoted aliyah, and he later gave to the Zionist movement. 5. His support went, as well, to Jewish causes closer to home. 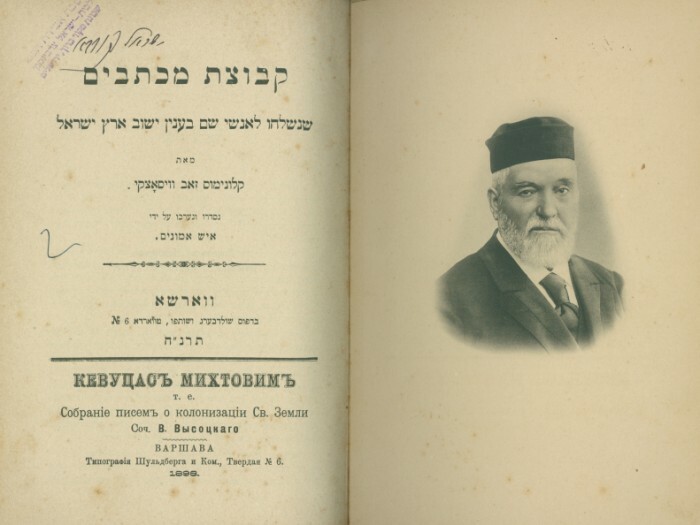 He gave help to Jewish soldiers stationed in Moscow, contributed to the Society for the Promotion of Culture among Jews in Russia, provided funding for the yeshiva in Volozhin, and gave his support to the Alliance Israelite Universelle and to ORT (ORT is a Russian acronym for “Society for Trades and Agricultural Labor”). 6. After the pogroms of 1881, he became active in Agudat Ohave Zion and then a member of the central committee of Hovevei Zion. In 1885 he visited Eretz Yisrael and prepared a survey of the general conditions there. His report was influential in the further work of Hovevei Zion. 7. Among his favorite philanthropic interests was Hebrew literature. Ha Shilo’ah, a Hebrew monthly, was initially financed by him. Influenced by his London manager Ahad Ha’Am [see my post of April 24, 2013], in 1894 he tried to foster the publication of a Hebrew encyclopedia for Jewish studies, but the project fell through; the 20,000 rubles originally intended for it were given instead to foster in other ways the haskalah (the enlightenment) of Jews in Russia. 8. In 1898 a collection of his letters was published containing his impressions of the Land of Israel and his activities there. 10. He died in 1904. In his will, he left his entire share of the Wissotzky Tea Company – a million rubles – to charity. Of this sum, 100,000 rubles was used for the establishment of the Haifa Technion. In Tel Aviv, Wissotzky Street is located north of Jabotinsky and west of Derech Namir off Moshe Sharet.